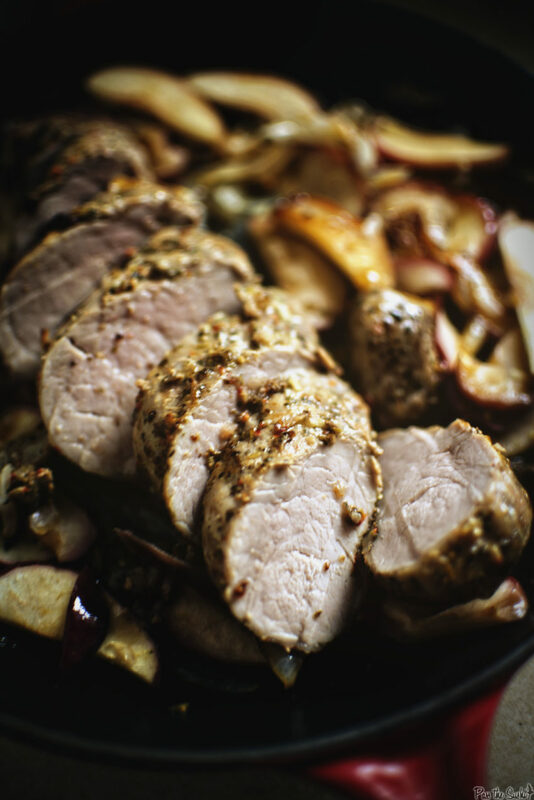 This Apple and Onion Roasted Pork Tenderloin is a perfect seasonal example of a fine mix of sweet and savory. An autumnal meal that every member of the table will delight in. There’s something divine about a dish that combine more than just one taste sensation. A balance many cultures strive for. And one that we often overlook with heavy meals and thick sauces. A simple fine mix of sweet and savory go a long way when you are looking to really create a dining experience that people truly enjoy. It’s something that makes you slow down and savor the minor delicacies of the blend and how well they all come together. Something we should attempt to build dishes around from time to time. Take a big step back from the heavy thick meals we are used to and break things down into simple, easily distinguished flavors, to create a story within out dish. Apple and Onion combine to set the stage. 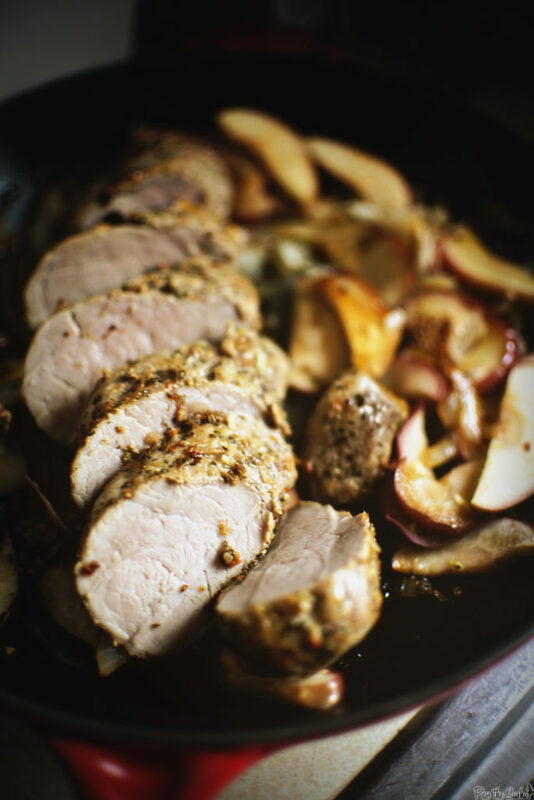 This recipe for Apple and Onion Roasted Pork Tenderloin is a perfect example of a fine mix of seasonal sweet with savory. There was a cold snap, it’s Fall, and you know what that means. PSL everywhere. Forget Pumpkin Spice Lattes. This is where it’s at for building an autumnal meal that every member of the table will delight in. Why should cinnamon and pumpkin get all the love every day from now until we break our flip flops out again anyway? There are so many crisp recipes just waiting for a little limelight. And, better yet, this one is probably cheaper than a grande-latte at your local watering hole. 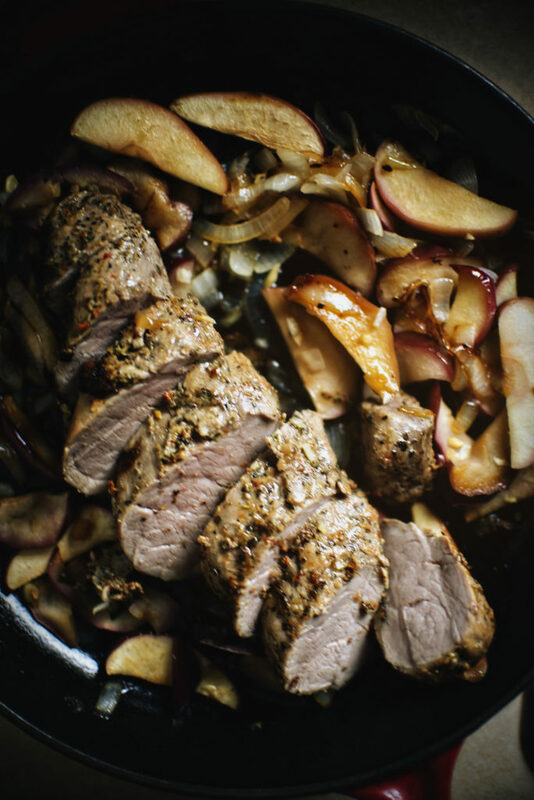 If you’ve tried my Apple and Onion Roasted Pork Tenderloin recipe, or any other recipe on GirlCarnivore.com please don’t forget to rate the recipe and let me know where you found it in the comments below. I get inspired by your feedback and comments! You can also FOLLOW ME on Instagram@girlcarnivore as well as on Twitter and Facebook. 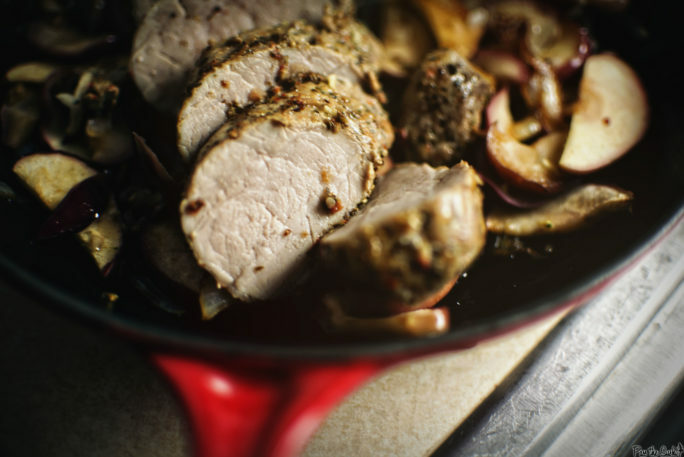 Quick and easy, the smaller pork tenderloin cooks in under 30 minutes, making it a perfect choice for weeknight suppers or roast a few for delicious entertaining. Rub the tenderloin with the minced garlic, spices, salt and pepper. Bring 1 tbs oil to heat over medium-high heat. Sear the pork on all sides, 1 to 2 minutes per side. Remove from pan and set aside. Add the remaining oil to the pan. Toss in the apples and onions. Nestle the pork on top and place in the oven to roast for 20-25 minutes. Remove the pork from the pan and wrap in foil to rest 5 minutes before slicing. Meanwhile, splash the apple cider vinegar in the pan and scrape up any browned bits and toss the cooked apples and onions. Arrange the sliced pork over top and serve.